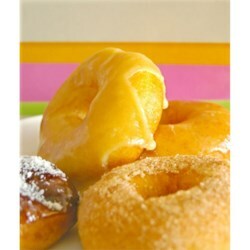 grandma's cookie jar: grandma's cookbook - I'm Making Doughnuts Today! My grandsons are coming over to spend the night, so I thought it would be a fun surprise for them for me to make some doughnuts today! I'm "torn" between two recipes, so I thought I'd share them both here and see which one you all think would be a fun surprise . . . or, maybe I'll make both??? At any rate, the first recipe is fairly simple, (you'll find it at this link) but is a yeast recipe . . . I will of course substitute almond milk for the milk and coconut oil for the butter so they will be non-dairy doughnuts as I want Caleb to be able to eat them . . . and his mom, too! I think the yeast will make these a bit "fluffy" and possibly a "lighter" doughnut; I have not ever made this kind of doughnut before, but it looks pretty tasty! 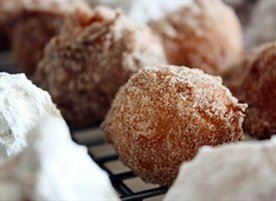 The second recipe is one I've made before - it is a, "doughnut hole" recipe (you'll find it at this link) . . . how can you make something which is a "hole"???!!!! At any rate, I have small cookie cutters which I use to cut out animal shapes, small hearts, etc so they end up being a "fun" doughnut! Once again, I'd make the substitutions so these will be non-dairy, but they are easy substitutions and the coconut oil should add some extra flavor! So, what do you think? Which doughnut should I make? Which one would you make?